Glasgow Warriors' latest signing Junior Bulumakau would relish the opportunity to play for Scotland. The Fijian-born British Army wing emigrated with his family at the age of 10, and signed a one-year deal with the Pro12 champions on Wednesday. "It's a massive dream for me; I've been watching Scotland since I was a kid," he told BBC Scotland. "It would be an honour - I just want to take it one step at a time, see how being in Glasgow goes." Gregor Townsend's Warriors have been eyeing Bulumakau for some time, taking the 24-year-old on trial in the run-in to their domestic play-offs. With the loss of record try-scorer DTH van der Merwe, Fijian fan favourite Niko Matawalu and Scotland's Sean Maitland this season, a certain amount of pressure rests on his shoulders to replace some of the departing firepower. Bulumakau did not get off to a bad start, however, beating France veteran Aurelien Rougerie on his way to scoring a sublime solo try in Friday's pre-season defeat in Clermont. "Yes, there is massive pressure," he conceded. "But you've got to take that first game, first chance with both hands. "Scoring that first try was an honour - against Rougerie, a person I looked up to, watched on telly." Bulumakau has served as an infantryman with The Royal Scots Borderers, 1st Battalion The Royal Regiment of Scotland since 2010, deployed on overseas training exercises to Kenya and Cyprus. But he has experience of playing in the Scottish Premiership with Heriot's and has also played for Belfast Harlequins and Bath Sevens. In May, he scored a try for the British Army as well as being named man of the match in their 36-18 win over the Royal Navy at Twickenham. "I came here when I was 10," he continued. "My dad was in the Army, moved over here, and since then I joined up and followed in my dad's footsteps. "Then I joined the Army, played for the Army, then the Army-Navy, then Glasgow approached me to come and join them. "The boys welcomed me with open arms, especially with the Fijian boys. It felt like home, but I've been here since I was a kid. "For my mum and dad, and for my family back home in Fiji, my grannies, my uncles, it's massive news for the Bulumakau family." Warriors head coach Gregor Townsend said: "Junior has a very good understanding of the game and has shown an excellent work ethic on and off the field. "He will add further competition for places in our back three and we're looking forward to seeing him challenge for a starting place over the next few weeks." Warriors have already signed fellow Fijian winger Taqele Naiyaravoro from the Waratahs this summer, while Scotland Sevens wingers Mark Robertson and Nyle Godsmark are training with the squad. 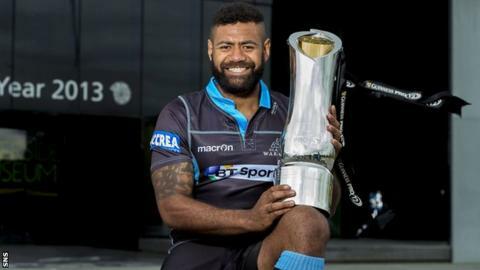 There were doubts raised in the Australian media over whether Naiyaravoro would join Glasgow because of his international commitments, but the player's agent has insisted he will fulfil his agreement to join the Scotstoun club.